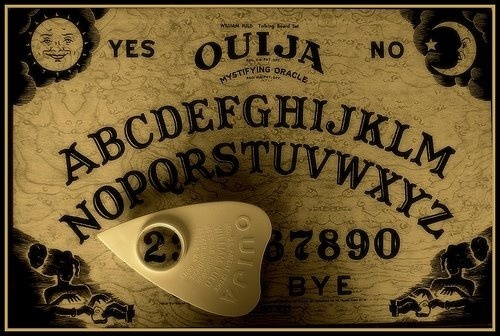 Ouija boards can be a fun and exciting way to connect with spirits, but when used improperly you can invite unwelcome guest into your home. When I was 12, my next door neighbor Shelly was cleaning out her childhood bedroom after graduating high school, preparing to go off to college. She threw away old barbie dolls, toys, and board games, of one was the Ouija that sat straight on top of her toy piled garbage pale. Two friends, my youngest sister, and I sat on the porch contemplating who will go and get the Ouija. I was the gutzy one, so I said “You guys are chicken, I’ll do it” and I ran to the garbage pale, grab the Ouija,and we all ran inside. We took the Ouija into my bedroom and immediately started playing with it. So we’re all sitting around this Ouija giggling and asking goofy questions. The board was not responding, it actually seemed silly and it was getting a bit boring. One of the girls says “OK, let’s get serious here, we have to ask a real question and we did, but still nothing. We all took our hands off the board, still sitting around it and talking. Out of no where the planchette flies off the board, shoots straight across the room, hitting a wall and falling to the floor. We all began screaming and freaking out, pointing fingers of who did it, but honestly nobody’s hands were anywhere near the planchette. My mother walked in and said “girls! calm down, game over everyone has to go home, it’s supper time” then she saw the Ouija. My Mother strongly opposes the Ouija for it is evil and causes nothing but problems she says. “where did you get this? and I honestly told her “Shelly threw it in the garbage and I grabbed it” My mother took the Ouija and tossed it back out to the garbage and warned us to never bring that thing back in the house again. Having to sleep in that room after that incident was terrifying. My sister and I shared the same room with bunk beds and we were both so terrified we slept with our blankets over our heads and walked each other to the bathroom for weeks. You should have 3 to 4 people touching the Planchette at the same time for a successful Ouija Board session. The sole purpose of this method of automatic writing is to combine the energies of multiple people to create the psychic energy needed to invite in spirits. Those who are sensitive and psychic can use the Ouija alone, or with only one or two people, because their energy is heightened. However, for us regular folks (including myself), the combined energy is a must. White candles are a symbol of protection and energy, and are thought to help fight against negative energy. Low light is ideal for the Ouija session because psychics have commented that spirit energy seems to thrive in the dark – candles are a great mix of light and dark. The flame is a focal point and lure for spiritual energy, that can also be used as a subtle way for the energy to affect physical things, such as… “Spirit, if you’re really here, make the candle flame move to the left”. The spirits being summoned by the Ouija session is working with the energies of everyone in the group. This means focus is important to a successful session. If one person is not fully in tuned to the board, or calm (and patient), then the message(s) coming through can be slow and confusing. Focus on the summoned energy that’s moving the Planchette and nothing else. The team should not change their train of thought during communication. And never, ever, finish the word or sentence verbally before the Planchette is done spelling things out unless you’re 100% sure it’s right. You’ll see the confusion in the Planchette, throw of the energy of the group, and sometimes cause the session to end. 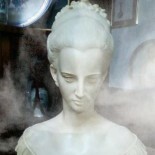 The Ouija session should never be interrupted because breaking the connection can cause significant delays and negative energy. Be seated at a table where the Ouija Board is at arm level so you don’t have to lean or bend your arms at awkward angles. Being uncomfortable or in pain can cause problems with communication because the energy is not positive. “Spirit, this is a safe place. We only wish to communicate with you, ask you questions and learn from you. Please come through and talk with us for a while.” Make sure everyone in the team is comfortable and calm. If still nothing… try changing the team members around, or remove any people who are uncomfortable or stressed. However, if the Planchette is moving, then it’s time to learn about the energy in the room. Or anything else you think might be important. A Ouija Board session is like an interview. Pretend to be Larry King or George Stroumboulopoulos, but with dead people. Ask lots of questions and lead the conversation at all times. There will be times when the spirit cuts in with it’s own, unexpected information. This is rare, but amazing! It’s basically anything that keeps the spirit talking but remember to Focus! Long sessions (over 15-20 minutes) can be difficult because of our modern society’s lack of attention, so stick to shorter sessions so no one in the team gets bored, unintentionally lowering the energy in the room, or inviting in the negative. As Big Rule #3 says, always say Goodbye!